PROPERTY DESCRIPTION: Super hard to find 20+- acre property in Greenwood County, Kansas near Severy. 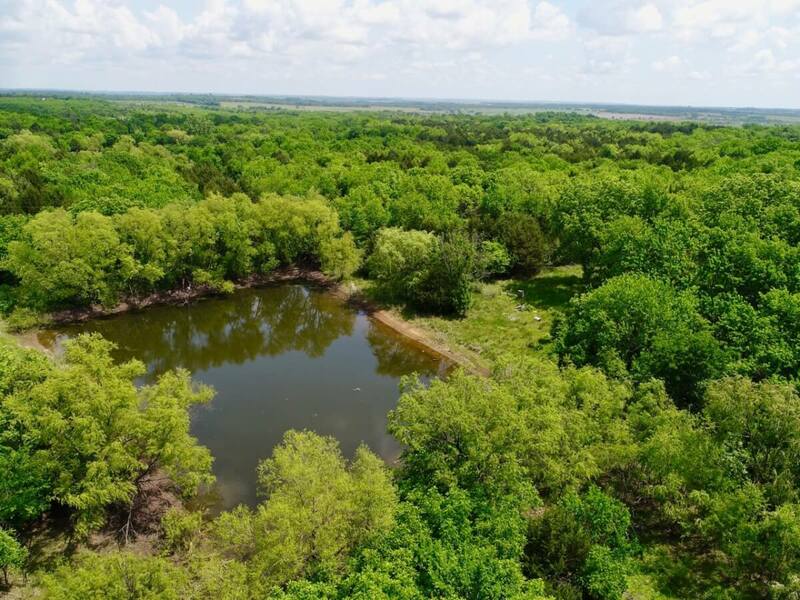 Features include a nice clear water Largemouth Bass fishing pond, heavy timber ideal for hunting, and hay meadow for agriculture income or wildlife bedding areas. Timber includes Walnut, Cottonwood, Hedge, and Eastern Red Cedar Trees among others. Included with the property is a Rural Water Meter. The property has electricity run to the property and once had a single wide trailer located east of the pond. What a unique opportunity to have a home building site, metal building with living quarters building site, or spot for a camper! There is a small metal building. Great location, just 1 mile from blacktop HWY 400 and quick access to Fredonia, Eureka, and Wichita! LEGAL DESCRIPTION: The W/2 SW/4 SW/4 Section 33, Township 27 South, Range 11 East of the 6th PM, Greenwood County, Kansas. LAND LOCATION: From the intersection of HWY 99 and HWY 400, East on HWY 400 1 Mile to T Rd, North 1 Mile to the property. 2017 REAL ESTATE TAXES: $122.50. TERMS: Earnest money required is $5,000 due at the conclusion of the Auction with the balance due upon Sellers submission of merchantable title and closing. There will be a 10% buyers premium added to the high bid to determine the contract price. Closing date shall be on or before July 27, 2018. Closing fee and title Insurance fee will be split 50/50 between Seller and Buyer. Selling subject to easements, restrictions, roadways and rights of way. This property is not selling subject to financing or inspections. Interested buyers need to view the property prior to the date of the auction and have financing available and any inspections performed prior to bidding. All pertinent information is available upon request. All announcements made the day of the auction take precedence over any other announcements or printed material.